Entity relationship diagrams are widely used in software engineering. ERD displays data as entities that are connected with connections that show the relationships between entities. The Chen ERD notation model is a popular standard and is widely used worldwide in database and software design. It is used to show the logical structure of databases. It represents the interrelationships between components of a database (entities). Chen notation has a linguistic origin. Here boxes showing entities could be imagined as nouns, and the relationships between them are in a verb form. They displayed on a diagram as a diamond. Chen ER diagram can be used as a guide for testing and communicating before the release of the software product. CS Odessa offers a free Chen Notation library and samples that are available for use with ConceptDraw DIAGRAM, this new solution for use by databases developers and software engineers can be downloaded from the Solution Park located on the ConceptDraw web site. Reveal the Entity-Relationship Diagram in the solutions panel. Open the Chen ERD library. Select connection line to depict the proper entity participation in a relationship set. To connect elements using this tool, drag the connector from one connect dot to another. Use the Action button menu to change diagram elements. Click the icon in the upper right corner of the object. Add text to your objects — simply select objects by one and enter the text. Customize your diagram using Format panel. 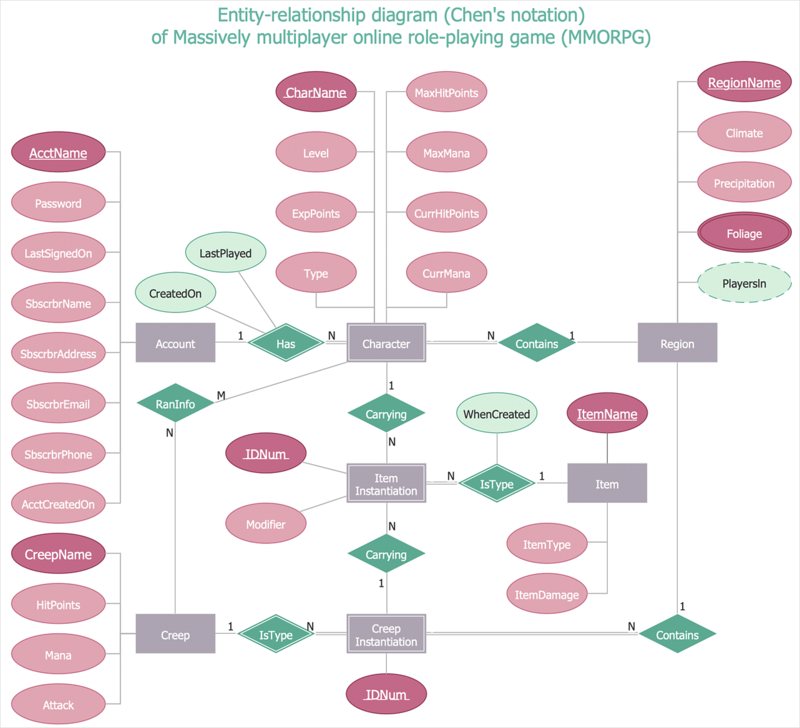 Result: Chen ER diagram (ERD) represents a massively multiplayer online role-playing game (MMORPG).